He received his master degree from the Department of History at Baku State University. Since 2000, he worked on the research projects of NGO “Impulse”. He became a director of the National Center for Strategic Initiatives (2004). During this period, he was engaged in sociological research, organisation of television talk shows and projects on the settlement of the Nagorno-Karabakh conflict. He is a founder of the largest youth organisation "Ireli" (2005). He was hired as an adviser to the Minister of Youth and Sport of the Republic of Azerbaijan (2007). 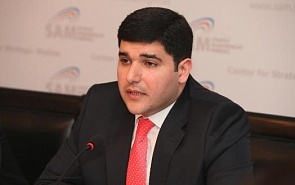 Since 2008, he has been working in the Political Analysis and Information Provision Department at the Presidential Administration of the Republic of Azerbaijan. He was appointed as a head of the sector at the Department (2011). Author of 2 books, 1 monograph and more than 200 academic publications. Merkel’s South Caucasus Tour: What Are Her Goals? ﻿On August 23, German Chancellor Angela Merkel went on a tour around South Caucasus, which was called historical even before the trip, since it is the first of a kind. Its agenda varied from country to country, since Azerbaijan, Georgia and Armenia are located in the same region, but implement different foreign policy concepts. What goals does the German Chancellor pursue and what did she achieve during her three-day trip? ﻿In the future, the Caspian Sea should become a “sea of cooperation, not competition.” The Convention on the Legal Status of the Caspian Sea establishes a platform for the beginning of constructive interaction between the five Caspian countries in energy and security. The signing of the document is a fait accompli, and no state outside the Caspian region can influence the situation in any way, says Valdai Club expert Farhad Mammadov. The summit of the presidents of Russia, Azerbaijan and Iran will undoubtedly adjust the process of reformatting in the Middle East region. The political effect of the summit is already evident, because it points to the growing role of regional actors in this troubled area, and the economic effect will depend on specific agreements, says Valdai Club expert Nina Mamedova. To date, the three countries have objective interest in such cooperation. The active cooperation between Russia, Turkey and Iran may have further repercussions for the South Caucasus. Historically, the three were the main rivals in the region. Due to geography and history, Russia, Turkey and Iran adjoin the region, but neither has a long border with all three South Caucasian states. Each state has its own geopolitical identity based on history, geography, civilization and religion. Azerbaijan's geopolitical identity has multi-layered features and connections to numerous geographical areas, covering the Eurasian continent. Baku - Moscow – Tehran: Geopolitical Alliance? On August 8, 2016, Baku hosted the first-ever trilateral summit of Azerbaijan, Iran and Russia. According to experts, this meeting shows the real interest of Baku, Moscow and Tehran to bring the relations between three countries to a new level of strategic cooperation.